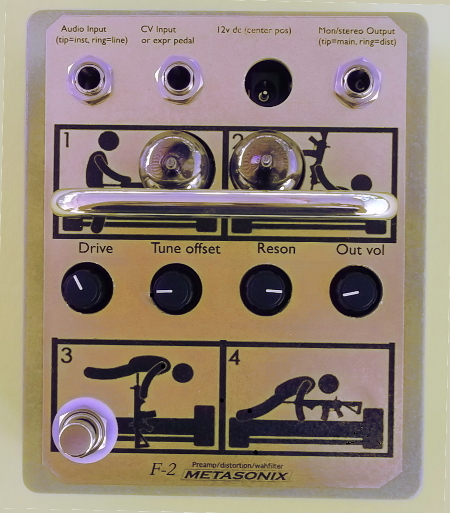 The Metasonix F-2 is the only tube wah pedal/preamp currently available. And it's the BEST ever made. It's all NOS tubes, an entirely tube signal path, and a unique tube wah filter with a 6+ octave range. It goes DEEP and gives pure vintage sound you've never had before. The preamp is dialed in for the perfect amount of touch-sensitive distortion with electric guitar. It uses a new-old-stock 5U8 triode-pentode made by GE long ago. It gives more gain and a nicer classic distortion than any 12AX7. The amplified signal then feeds into a distinctive bandpass filter, based on another 5U8 triode-pentode tube. The filter's resonance is adjustable with a front-panel knob, allowing you to use it as anything from a gentle equalizer effect to a shrieking oscillation. The filter center frequency is adjusted with a real, NOS Excelitas "Vactrol" LDR, for the smooth effect of a real Vactrol-varied filter. This is the same circuit Metasonix used in previous products, such as the R-54 "Supermodule", the S-2000 synthesizer, and the D-2000 drum machine. Wait, you're saying "this isn't a wah pedal, there's no moving footpedal on top". Because of cost and space issues, the F-2 contains just the electronics of a wah effect. In order to sweep the wah filter by foot, you plug in a "standard" expression pedal. It connects to the F-2's CV input with a single cable having a TRS plug. Expression pedals are readily available from all music dealers. This gives the F-2 an advantage over conventional wah pedals; if the pot in the pedal goes bad (which they always eventually do), just plug in another expression pedal. The CV input also accepts a 0-10 volt control voltage produced by various analog synthesizer equipment. And there are "hidden features". The TRS input jack actually accepts two signals: the guitar preamp is on the "tip" connection as usual, and the "ring" connection is an optional line-level input which bypasses the preamp. And the output is also a TRS connection; the "tip" is the output of the preamp feeding into the wah circuit, while the optional "ring" connection is the preamp output only, minus the wah effect. Connect the F-2 like a typical pedal effect, and it acts like a pedal effect. But these added connections increase the feature set for other applications. If you don't play guitar the F-2 is still eminently usable as a preamp and sweepable filter with any kind of input signal. It can be integrated into modular-synthesizer setups as a typical filter effect. Or crank up the resonance to use it as a VCO. It roughly tracks a Hz/V control voltage; modular adapters are available from other firms to convert V/oct CV. There's a SPECIAL BONUS if you purchase one of the first twenty F-2 pedals! Each of those twenty units will have a different stupid internet meme printed on the gold-foil front panel. Collect them all, insult your friends or yourself! But hurry! Once they are gone the F-2 will go back to being just another awesome sounding and unique pedal! These demos show the F-2 with no other effects or processing applied. Yes, it's hand-made in California, not China. Yes, it's completely analog. Unavoidably and brutally pure analog. And no one else is doing it. Power requirement: 12 volts DC ONLY, 2 amps at cold, 750 mA after warmup. "Universal" AC adapter is included which will run on 120v or 240v mains. The F-2 is in a massive cast aluminum enclosure with front-panel art printed on gold foil and a gold-plated protective bar over the tubes and controls.